If you were one of Han Solo’s friends, would you have sold him out to Jabba the Hutt in order to obtain the lovely bounty that is placed on his head? I suppose when times are hard, and people are desperate, the once sacred line of loyalty might be crossed. 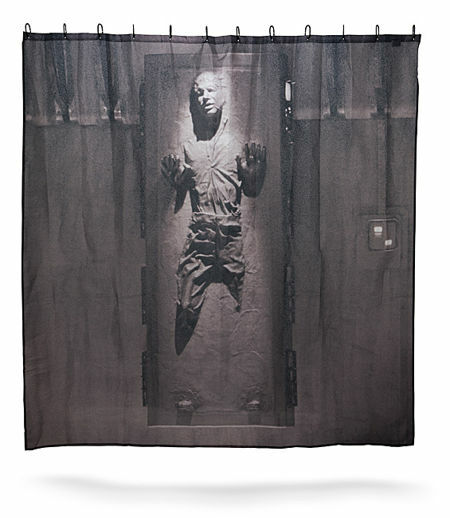 Well, you do not have the kind of conscience to do that, which is why the farthest which you will go to would be to fork out $24.99 for the Han Solo in Carbonite Shower Curtain. Yes, that’s right, add a Star Wars theme to your bathroom whenever you shower, and he won’t be able to say a single word even when he sees you stark naked. After all, he’s frozen in carbonite, right? That ought to serve the free wheelin’ and dealin’ smuggler right. Each Han Solo in Carbonite Shower Curtain will include a dozen black shower curtain hooks, and the shower curtain itself is made out of polyester.